I own a small consulting company. This time of year gets quite hectic as clients hand off work that needs to be done before they leave for Christmas vacations. Good for business. Not so good for accomplishing anything around the house. 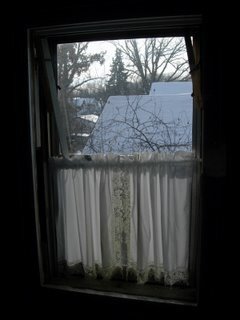 This combined with the fact that I got a little overly ambitious last fall when refinishing my windows, I needed to order replacement sash pulleys, and the whole mice debacle distraction......has left me with an upstairs window that is completely without a sash. It has a less-than-effective aluminum storm window, and that's it. Not a big deal until you consider I live in Minnesota. Last week saw tempetures of -11 degrees. To add to the drama, my bed is less than 4 feet away from that window. How am I still alive you ask? 3M shrink plastic weatherproofing. No lie. This stuff really works. The window is airtight. I put the plastic over the little crooked curtain and all. Granted not the most energy efficient situation, but surprisingly my energy usage (and bills) have been less than last year. Go figure. Am I the only one that has an uncontrollable urge this time of year to fill my house with Chia Pets and The Clapper? I am the fourth owner of my house in 7 years. Of those 7 years, I have owned the house for 3 yrs. 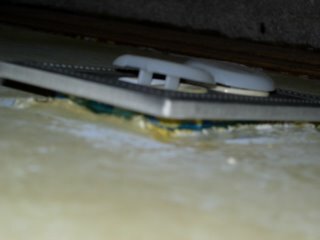 My house was lost in a foreclosure, purchased by a flipper and then purchased by a semi-flipper. Each one has left a bit of a legacy. And every so often, one of those legacies irritates me enough to write a blog entry. The last owner decided that she would recoup more money by finishing off the expansion space in the upstairs attic prior to selling the house. Good idea, gone bad. Unfortunately, her motivation to increase her return on investment seems to have led to sloppy work. 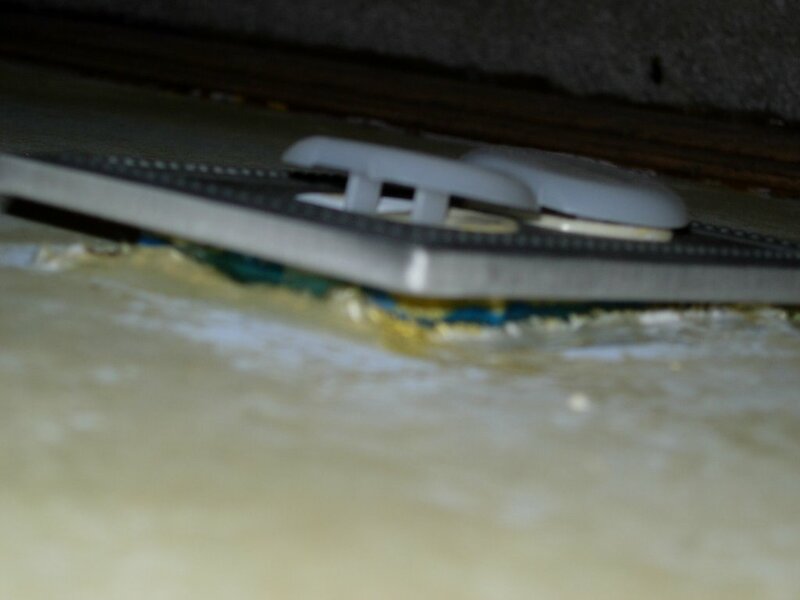 Insulation was added, only it was put in upside down. It is now black from airflow and needs to be replaced. 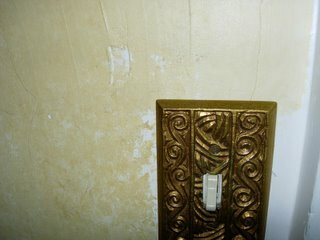 Outlets were added, but workmanship was lousy. 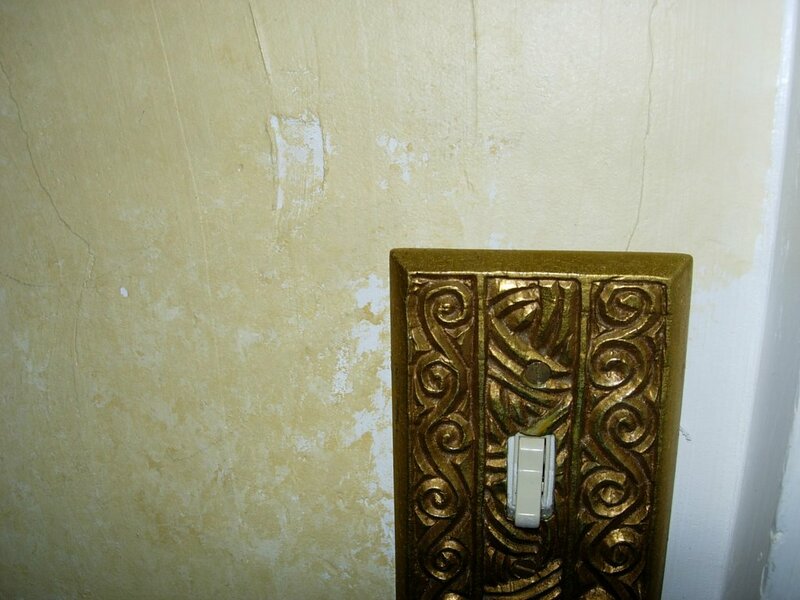 Some of the outlets don’t fit in the wall cavity and sit outside of the drywall. One of the outlets actually shot a bolt of electricity out of it one day when I unplugged a lamp. Cheap carpeting was used and it has now stretched out into gentle waves across the room. It needs to be removed and the fir floors below it redone. Colonial oak baseboard was added because it was stock even though the floors are maple & fir. It needs to be painted. Whoever worked on the drywall didn’t measure the drywall…..so angles are off and straight lines are not straight. Sand the mud? No way. Then to hide the flaws….they sponge painted it all. Nice trick. Most of this stuff I can deal with. It’s on my “to do” list, and at some point I’ll get around to messing with it. In the scheme of things it’s not really a big deal. There is one thing though that makes me crazy. 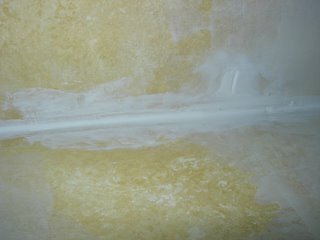 When they added drywall, they did not tape any of the seams or corners. They slapped on some joint compound and called it a day. So, I lay in bed and look at the never ending series of cracks and seams that appear overnight. I know from my energy audits how much warm air is lost to those cracks, so as they appear….I fix them. Eventually, I will probably have the drywall pulled out where it is crooked and then the whole mess skim coated by a pro. Until then, I patch. I spent a few hours on Saturday doing it. It just seems such a waste of time when I have REAL old house restorations to be made (windows to restore, plaster to patch, storm windows to track down….) to be repairing half-assed work that is less then 5 yrs old. If you are going to do it, why not do it right? There. I have said my peace. I feel better now. I am not one to wish bad on others, but if there is house karma……I hope what goes around……comes around. I locked myself out of my house this weekend. It was one of those instances where you watch your hand pull the door shut, hear the lock click, and listen to your brain yell "nooooo" all at the same time. Then you try to push open the door...as if this one time the lock didn't catch and you will be able to shove it open. Ha. Luckily my neighbor was home and let me use their phone to call The Keeper of my extra key. Because The Keeper lives quite a ways away, I had some time to kill outside on my front doorstep (in 9 degree weather). First I chatted up my neighbor to the south of me. We negotiated a deal where I will keep him supplied with homemade jams for the winter, and he will use his snowblower to clear my front sidewalk after the bigger snowfalls. I was quite pleased with this little "jam for snow" deal I had struck, when my neighbor to the north happened to walk by. Still having some time to kill, I asked him if he remembered what my front doorstep looked like before the little wood platform was constructed (replacing this has become my new hot topic). This neighbor is a wealth of information about my house - he knows what happened, when, by which owner, and what it looked like before. I was shocked when he told me there had been a little wood entryway by my front door. I didn't see this coming. Not by a long shot. An entryway. But it does explain some of the holes in the stucco above the door and why that stucco isn't painted. Another piece to the puzzle. It's snowing here today. Nothing drastic, but a good few inches of pretty fluff. This is probably the most snow we have received yet this year. 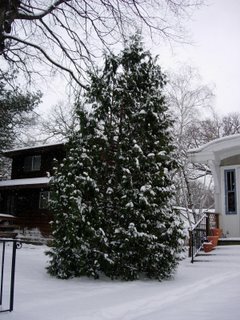 Come February, we would be loath to admit it.....but we get excited here on the first snow. We are, after all, Minnesotans. We were starting to worry that winter would never arrive. With the first snow, all the neighborhood men get to pull out their new toys and finally put them to use. This morning found at least two of my neighbors hauling out their new 200 lb snowblowers to remove that 2" of snow from their sidewalks ;-) Then inspired by neighborly goodwill (and probably a need to see what their new toys will do full throttle), they also cleared the sidewalk for most of the block. Ah, the first snow. 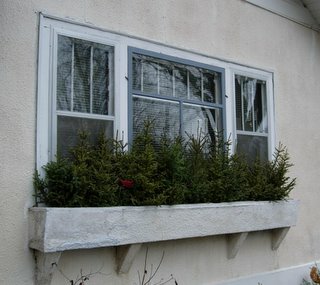 I spent some time (freed up from not having to shovel) putting spruce tips in my front planter. This will be the full extent of my Christmas decorating. After recent events, I plan to spend a few days in homeowner denial...pretending that I rent. As a renter, today I will be making blueberry scones (from blueberries my parents helped my pick last summer in 95 degree weather up at their cabin) and blackberry cobbler (from backberries canned by an ex-bf's mother - that I have been hoarding in my cabinets for too long). Maybe I will spend some time online shopping for Christmas presents. A nearly perfect snowy afternoon activity, I think.